What is a lean business plan and benefits of lean business planning are more management and accountability in any real business. It's a plan, not a document. A lean business plan does what every business owner and aspiring startup needs to manage strategy, tactics, execution, and essential business numbers. It exists for internal management, not for outsiders. It stays lean and simple with just bullet points for essentials and a collection of lists and tables. It should be reviewed and revised at least monthly so it stays fresh. A lean business plan steers the company toward its goals, and also to tracking and managing progress, expectations, and accountability. Why lean? Because lean means strong with muscle but no fat. Lean means useful. No frills. You may have heard of the lean startup or lean manufacturing. 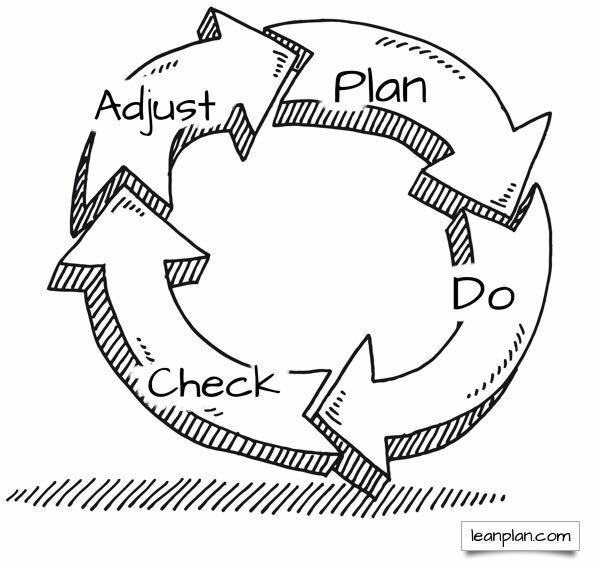 It’s a set of ideas that started about 70 years ago, revolving around PDCA: plan-do-check-adjust. It was adopted later by a collection of experts and authors, most notably Eric Ries with his work on The Lean Startup. It’s a process of continuing improvement in steps, or cycles, each one involving plan, action, checking results, and revising the plan to start again. That term lean, and the idea of continuous process, applies perfectly to business planning. It’s a shame that so many people think of a business plan as a document, a formal business plan; in reality good planning is a streamlined, simple process that could be called PDCA, which I prefer to call PRRR: plan-run-review-revise. Strategy. Define strategy with a few key bullet points that serve as online reminder of strategic focus on a problem people have, your solution to that problem, your specific target market, and why you and your business are ideally suited to match that solution to the problem and the market. 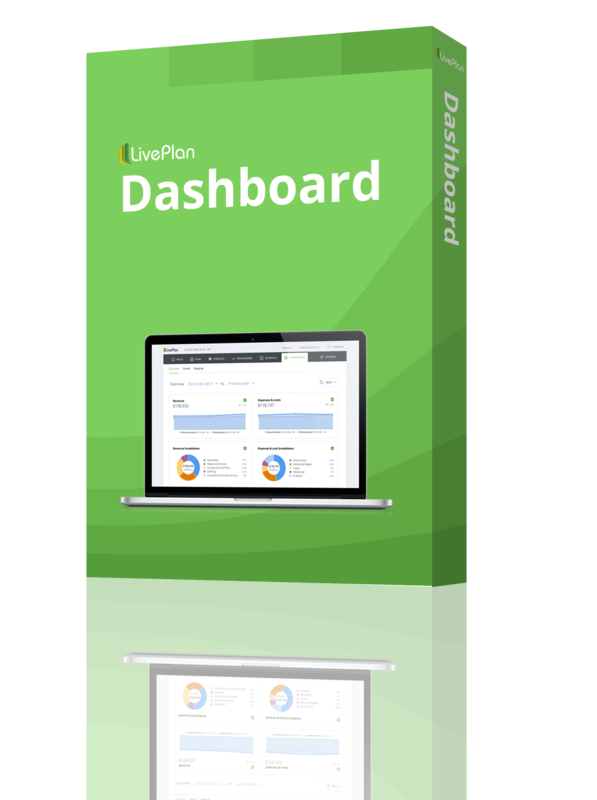 Use just bullet points or the top portion of a LivePlan pitch page. Execution. Strategy is useless without execution. Execution includes sales and marketing tactics such as pricing, channels, messages, media, social media, promotion, and so forth. Execution is also product or service tactics such as versions and launch dates, features and benefits, versions, bundling, technology, and so forth. Execution might also include managing and recruiting a team, raising funds, and so forth. The plan lists execution in bullet points, for management only. Concrete specifics. List of assumptions, milestones, tasks, responsibilities, performance measurements, and expectations. Essential business numbers. Sales forecast, spending budget, and cash flow projections. A Lean Plan is an easy way to get your strategy, tactics, milestones, and forecasts documented in a simple format. You can download a free template and build your Lean Plan today. 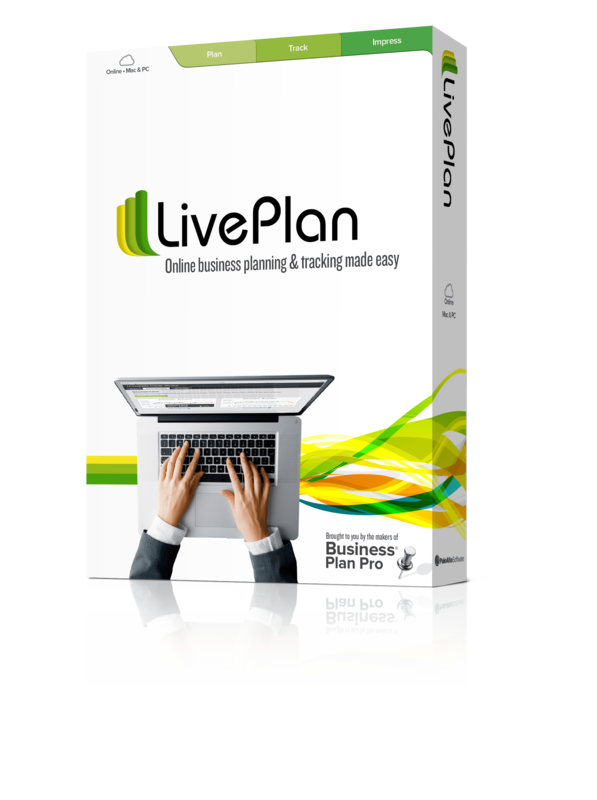 Or even better, if you are a LivePlan user, the LivePlan pitch page automatically includes the key points of a lean business plan, in a single place. The lean business plan alone isn’t enough; it has to be part of a process that includes regular reviews and revisions. Management needs to keep the lean business plan live. That’s what generates the business benefit. You have to do the plan to set the system going, then track progress and performance metrics, keep up with developments, and review regularly to turn plans into management, accountability, and execution. All of that is the run-review-revise that complements the plan in PRRR. 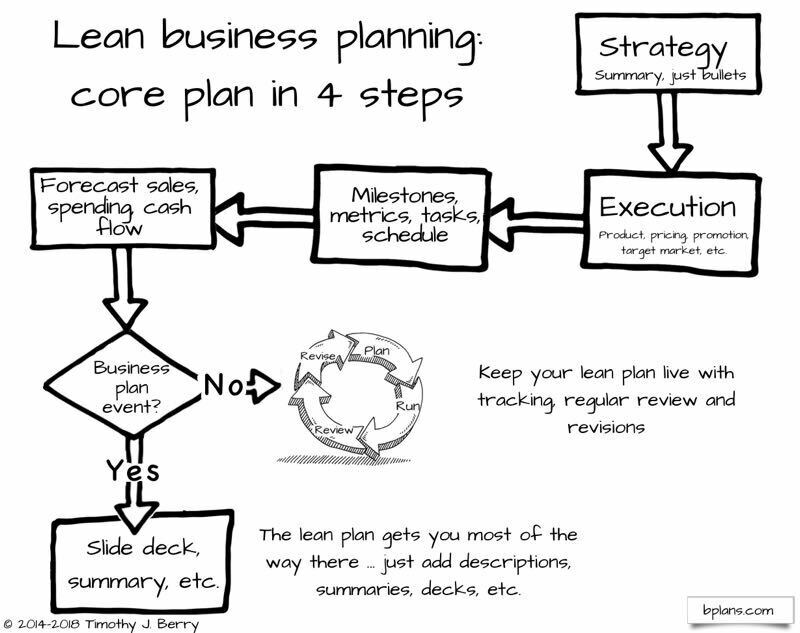 The lean business plan is not a formal business plan document, composed of specific business plan sections. However, when (and if) there is business purpose and business use of a formal business plan document, the Lean Plan is an excellent first draft. 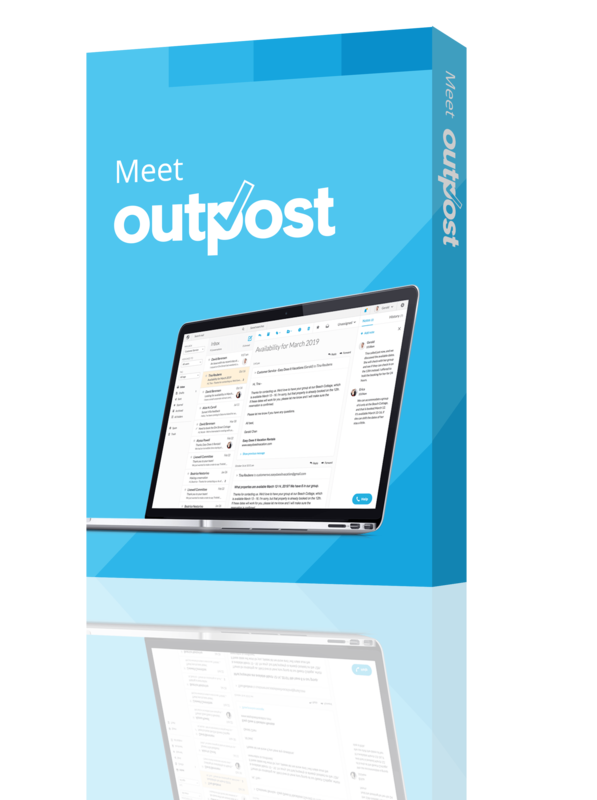 Add descriptions and information for outsiders, make sure you have all the key business plan components, and you have the formal business plan document you need. I work with the idea of the business plan event, which is what I call it when there is a real reason for a business to submit a plan to outsiders. The common business plan events are seeking a commercial business loan and seeking investment from outsiders. My idea of the Lean Plan is that you don’t add the required bulk to your lean business plan until the business plan event makes it worth the trouble. In the meantime, however, even if the lean business plan doesn’t require formal business plan sections like market analysis or detailed descriptions of your marketing or product/service plan for outsiders, good management still requires you to know your market and make informed decisions on marketing and product. You don’t, however, have a reason to write it all up as text for outsiders. You keep it in lean business plan bullet points. It’s short, simple, streamlined, just big enough to steer the business, and just big enough to meet the business need. It’s all about results and managing a business. Accountability. Metrics. Priorities. A Lean Plan starts simple and grows organically. 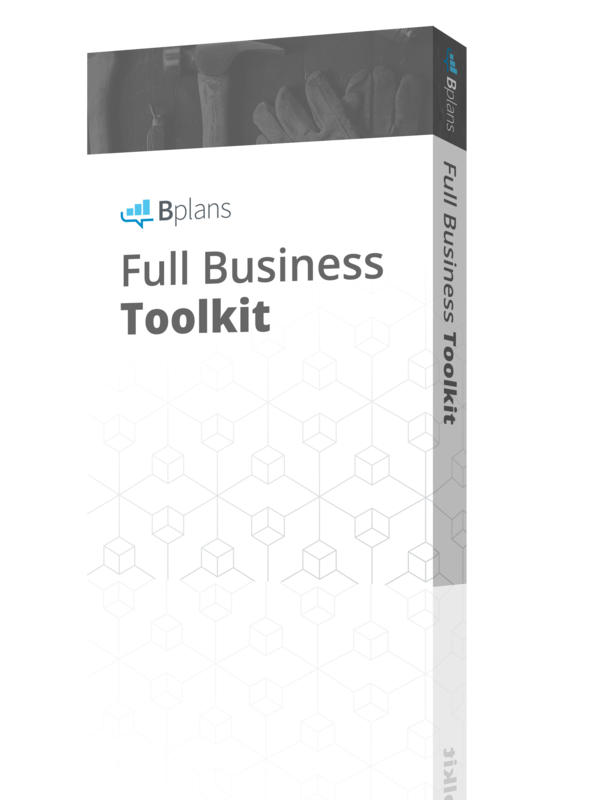 Download our Lean Plan Template and build your Lean Plan today; or, if you’d rather leave it to the pros, check out LivePlan’s business consulting—you’ll get an MBA-written business plan in five business days.